The British singer Yusuf Islam, formerly known as Cat Stevens, is due to be sent back to London after being refused entry to the United States. The US authorities say the decision was made on national security grounds. Mr Islam was on a flight from London to Washington when officials realised his name was on a "watch list". The plane was diverted to another US airport. Muslim groups in Britain and the United States have criticised the decision, saying Mr Islam is a man of peace. The Council on American-Islamic Relations said in a statement that the move "sends the disturbing message that even moderate and mainstream Muslims will now be treated like terrorists". Mohammad Abdul Bari, deputy general secretary of the Muslim Council of Britain, said Mr Islam was a moderate man. "It is a slap in the face of sanity. If prominent, well-known personalities are treated like this, then how can there be bridge building?" he said. British Foreign Secretary Jack Straw is also understood to have raised the issue with the US Secretary of State in New York. Mr Islam, who converted to Islam in 1977, was on United Airlines Flight 919 when it was diverted 600 miles (1000km), landing in Maine. After being interviewed by US officials, he was denied entry into the US. Transportation Security Administration (TSA) officials said the access was denied "on national security grounds", without giving any further details. A spokesman for the US Department of Homeland Security, Garrison Courtney, told the AFP news agency that Mr Islam's name "was placed on watch lists because of concerns that the US has about activities that can potentially be related to terrorism". "More recently, our intelligence community has come into the possession of additional information that further heightens our concerns towards Yusuf Islam," he added. Four years ago, Mr Islam was deported from Israel over allegations that he backed militant Muslims. 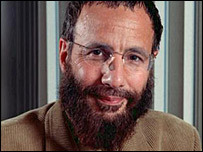 Yusuf Islam was born Stephen Demetre Georgiou in London to a Greek Cypriot father and Swedish mother. As Cat Stevens, Yusuf Islam had a string of hits in the 1960s and 70s, including Wild World and Morning Has Broken. He then abandoned his music career to devote himself to promoting Islam. One high-profile activity was the founding of a Muslim school in London.